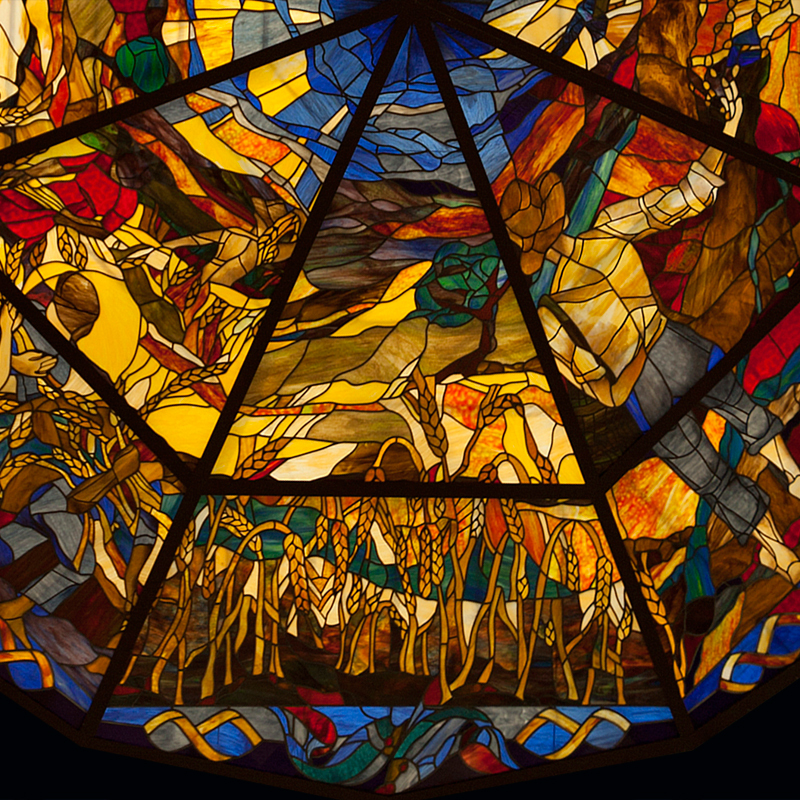 When I was commissioned to design a pair of stained glass windows to be installed in the Ray I. Riley Alumni Center at SWBTS in Fort Worth, Texas, I knew they would have one of the most brilliant sources of light possible—the Texas sun. 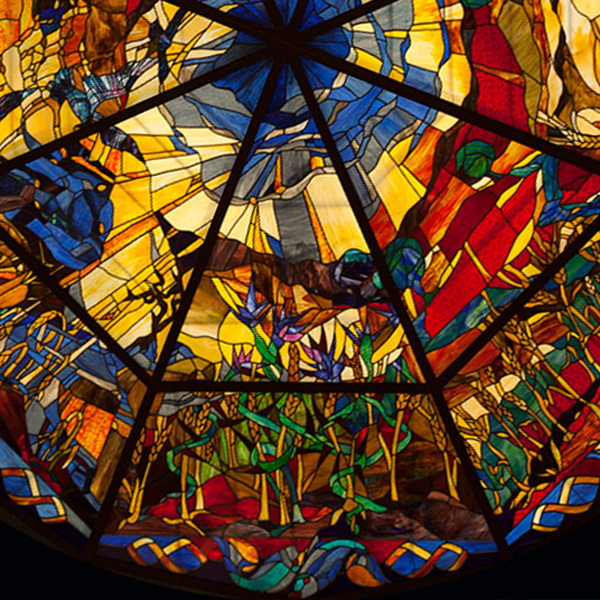 Both windows are octagonal, composed of 8 large panels, and they’re suspended from the glass ceiling of two main entrances to the building. They are a visual interpretation of a theme—Touch the World, Impact Eternity—that hints at two realms: the physical world we all call home, and the spiritual realm that exists beyond time and space. I decided to let each window represent one of these realms, but to link them together with shared symbolism suggesting these two worlds mingle in mysterious, wonderful ways. The border of interlocking fish is consistent between the two windows. It alludes to Jesus’ promise to make his followers fishers of men. The color of the fish shifts between the two windows from blue to golden—a subtle chromatic clue distinguishing between the earthly realm and God’s eternal kingdom. Jesus’ parables are so visual that when I thought of the earthly realm, the story of the sower and the seed immediately came to mind (Luke 8:4-15). The seed thrown by the sower represents the word of God. The sower isn’t the creator of the seed, the source of its growth, or the cause of the harvest. His job is simply to sow the seed of the word generously, extravagantly, without any concern for where the seed lands. Illustrating each movement of the parable of the sower and the seed required six panels. To fill the other two, I decided to draw from Jesus’ exhortation to his followers to look to the fields that are white and ready for harvest. It’s as if Jesus is calling the sower back to finish the job by harvesting the crop that’s been sown. One panel shows the laborers who have come to reap the harvest and the other shows the ripe harvest field waiting for workers to arrive. The wheat represents those who allow the word of God to take root in their lives and bear fruit. The wheat becomes a visual metaphor for the redeemed who appear as worshipers before the throne of grace.